Also Called: Alkali bulrush, cosmopolitan bulrush, saltmarsh bulrush. Culms: Erect, sharply triangular, 1/4 to 3/4 inch thick at base. Leaves: Several, scattered along lower two-thirds of culm, up to 1/2 inch wide, v-shaped. Inflorescences: Clusters of spikelets, usually 2-15, terminal; subtended by several involucral bracts, leaflike, ascending or spreading, 4 to 8 inches long. Flowers: Ovoid to ovoid-cylindric, 1/2 to 1 inch long, 1/4 to 1/5 inch wide, pale brown, usually all sessile or some sessile and some stalked; scales egg-shaped, minutely pubescent; margins thin; tip notched; awn short. Fruits: Achene, egg-shaped, pale brown, short-beaked, less than 1/6 inch long; style 2-cleft. Habitat: Marshes, pond margins, and intermittently wet areas; moist alkaline and saline sites; sandy, silty loam, or fine clayey soils. Uses: Native Americans used the seeds for food and plant fibers in the making of baskets, mats, and sandals. 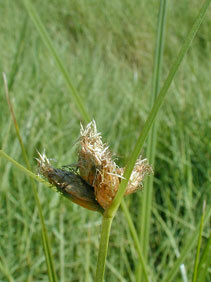 Prairie bulrush is sometimes used for erosion control in constructed wetlands. Waterfowl use the plants for cover and eat the seeds. Comments: Prairie bulrush forms dense stands via coarse rhizomes. It will tolerate standing water for brief periods of time and will also tolerate drought conditions.